The notorious trouble spot at the railway crossing needs to be made safer for schoolchildren and work to make this happen is due to take place in the spring. Following a meeting of the village organisation at the end of January, the school route will now benefit from improved safety. Municipal councillor Therese Mösching has taken the parents' votes very seriously and has worked out a package of measures along with the municipal administration. The planned measures aim to get rid of the trouble spot around the railway crossing. In the future, road signs will warn traffic about the young pedestrians in the area. Just before school starts and at the end of the school day, a flashing light will come on to alert drivers to the potential danger. The pedestrian markings on Rübeldorfstrasse will be moved towards the bridge so that the children have a better overall view. Also, the waste disposal site right by the village bridge attracts a lot of vehicles and a slightly new layout is needed here too to calm the traffic. But the most important element is the railway crossing. Currently, there’s a narrow colour-coded alleyway for pedestrians. This will be widened and delineated by two posts. "If everything goes according to plan, the measures will be implemented in spring as soon as the weather permits," promised Therese Mösching. The council member has held various discussions in an attempt to defuse the situation as quickly as possible. This includes talking to the school management committee, with Mösching representing their views. "Parents driving their children all the way to school put a heavy strain on traffic volumes at critical times." The general meeting of the village organisation also addressed this problem: "It would alleviate the traffic situation enormously if the children could get themselves to school or if shared taxis were organised and the children were then able get in and out on the station square." Mösching would like to implement the last part of the Sanona project during her term of office, with the expansion of Campingstrasse. 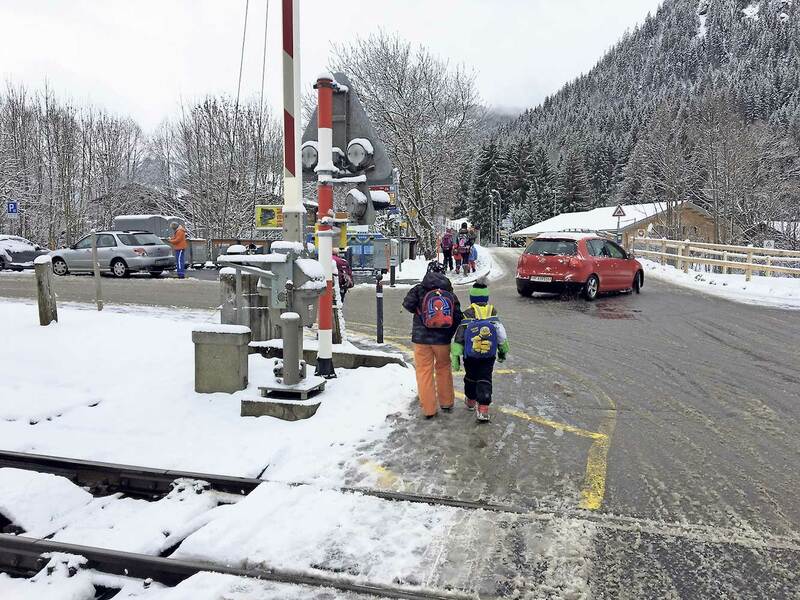 The MOB has long been talking about converting the train station in Saanen and the municipality has been waiting patiently for the detailed plans. Now, there's news that the MOB won't be starting the project until 2023. "This is very late for us," said the local councillor. Therefore, the municipality will commission two specialised traffic planning agencies to develop appropriate traffic concepts. The project includes 15-hour parking lots, car parking spaces and a safe route from the main road to the school building via Campingstrasse. It's very important that the conversion work for both projects is discussed and coordinated. "Further discussions will pave the way ahead." In the spring, the construction work for the Westerschliessung Dorfrütti is due to begin. Since no objections have been raised, building permission can now be granted. This means that the heavy traffic that has been driving through the village of Saanen will in future travel via the Dorfrütti to the mining and landfill site. Construction is scheduled to begin this year, with completion in the spring of 2020, according to Max Moratti, the owner.